The NORM.S.INV Function is categorized under Statistical functionsFunctionsList of the most important Excel functions for financial analysts. This cheat sheet covers 100s of functions that are critical to know as an Excel analyst. It will calculate the inverse normal cumulative distribution for a given probability value. 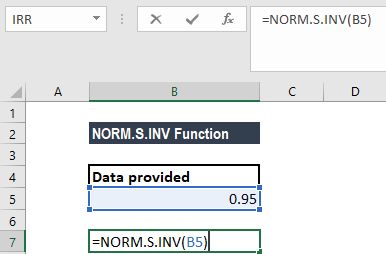 Introduced in MS Excel 2010, the NORM.S.INV function is an updated version of the NORMSINV function. As a financial analystFinancial Analyst Job DescriptionSee a real Financial Analyst Job Description including all the skills, experience, and education required to be the successful candidate for the job. Perform financial forecasting, reporting, and operational metrics tracking, analyze financial data, create financial models, the NORM.S.INV is useful in stock market analysis. We can use the function to understand how a portfolio is affected by any additions or withdrawals made. Suppose an appliance manufacturer is investigating the failure times of the heating element of the company’s toasters. It wishes to determine the time at which specific proportions of the heating elements fail in order to set the product’s warranty period. Heating element failure times follow a normal distribution, with a mean of 1,500 hours and a standard deviation of 300 hours. The manufacturer can use the NORM.S.INV function to determine the time by which 5% of the heating elements fail, the times between which 95% of all heating elements fail, and the time at which only 5% of the heating elements continue to function. If the distribution of the heating element failures follows a normal distribution with a mean of 1,000 and a standard deviation of 300, the time by which 5% of the heating elements are expected to fail is the inverse CDF of 0.05. Probability (required argument) – It is the probability corresponding to the normal distribution. It is the value at which we want to evaluate the inverse function. 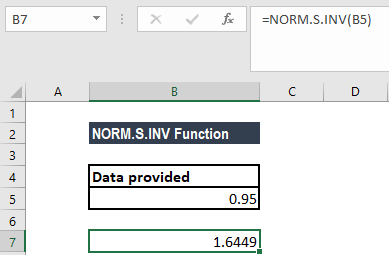 How to use the NORM.S.INV Function in Excel? #NUM! error – Occurs when the given probability argument is less than zero or greater than one. The precision of NORM.S.INV depends on the precision of NORM.S.DIST. NORM.S.INV uses an iterative search technique.